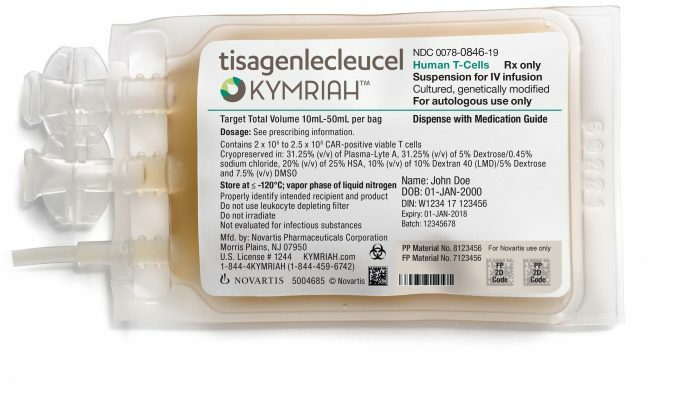 Novartis’ Kymriah (tisagenlecleucel) will be the first chimeric antigen receptor T-cell (CAR-T) cancer immunotherapy to reach the U.S. market following FDA approval yesterday. Kymriah, previously known as CTL019, is indicated for the treatment of second or later relapsed or refractory (r/r) patients up to age 25 with B-cell acute lymphoblastic leukemia (ALL). “With the approval of Kymriah, we are once again delivering on our commitment to change the course of cancer care,’ Novatrtis CEO Joe Jimenez said in a company statement. Novartis is one of two leading developers of CAR-T therapies. The other is Kite Pharma, which is awaiting an FDA decision on its CAR-T treatment axicabtagene ciloleucel (formerly KTE-C19) for treating relapsed or refractory aggressive non-Hodgkin lymphoma (NHL) in patients who are ineligible for autologous stem cell transplant. Kite has agreed to be acquired by Gilead Sciences for $11.9 billion, a deal announced Monday. The FDA accepted Novartis’ Biologics License Application (BLA) for Kymriah, filed in March, for Priority Review—under which FDA set a goal of taking action on Novartis’ CAR T-cell candidate within 6 months, compared to 10 months under standard review. The FDA acted more than a month ahead of its Prescription Drug User Fee Act (PDUFA) target decision date, which had been set for early October. Kymriah is not the first gene therapy ever approved. That distinction was obtained in October 2012 by uniQure’s Glybera, which won European Commission approval to treat hereditary lipoprotein lipase deficiency (LPLD), but whose price tag of €1.1 million ($1.2 million) proved too high. In April, uniQure said it would not renew its European marketing approval for Glybera. Soon after gaining European approval, uniQure pursued FDA approval, but dropped that effort in 2015 after the agency requested that the company submit data from more than one clinical study to support a BLA. The FDA based its approval of Kymriah on the results of the pivotal Phase II ELIANA trial (NCT02435849), an open-label, multicenter, single-arm study and the first pediatric global CAR-T cell therapy registration trial. ELIANA assessed patients in 25 centers in the U.S, as well as in Europe, Canada, Australia and Japan. In ELIANA, 68 patients were infused and 63 were evaluable for efficacy. Results showed 83% of patients (52 of 63) who received treatment with Kymriah achieved complete remission (CR) or CR with incomplete blood count recovery (CRi) within three months of infusion. Results among responding patients also showed no minimal residual disease (MRD), a blood marker that indicates potential relapse. Novartis also submitted data from a U.S. multicenter trial and a single site trial examining the safety and efficacy of Kymriah among pediatric and young adult patients with r/r B-cell ALL. The agency’s approval came six weeks after an advisory committee unanimously recommended in favor of the company’s leukemia-fighting treatment. First developed by the University of Pennsylvania, Kymriah uses the 4-1BB co-stimulatory domain in its CAR to enhance cellular responses as well as persistence of the treatment after it is infused into the patient, which may be associated with long-lasting remissions in patients. In 2012, Novartis and Penn launched their global collaboration to further research, develop, and commercialize CAR T-cell therapies, including Kymriah, for the investigational treatment of cancers. Children’s Hospital of Philadelphia (CHOP) was the first institution to investigate Kymriah in the treatment of pediatric patients and led the single site trial. “This therapy is a significant step forward in individualized cancer treatment that may have a tremendous impact on patients' lives,” Carl June, M.D., the leader of the Penn team, said in Novartis’ statement. Dr. June is the Richard W. Vague Professor of Immunotherapy, director of the Center for Cellular Immunotherapies in Penn’s Perelman School of Medicine and director of the Parker Institute for Cancer Immunotherapy at Penn. The FDA acknowledged Kymriah’s potential for severe side effects by approving the treatment with a boxed warning for cytokine release syndrome (CRS), a systemic response to the activation and proliferation of CAR T-cells causing high fever and flu-like symptoms, and for neurological events. Other severe side effects of Kymriah include serious infections, low blood pressure (hypotension), acute kidney injury, fever, and decreased oxygen (hypoxia). Novartis is also required to conduct a post-marketing observational study involving patients treated with Kymriah, in order to further evaluate the long-term safety of the CAR-T therapy. In its registrational ELIANA trial, 49% of patients treated with Kymriah experienced grade 3 or 4 CRS. Also, CRS was among the most common adverse reactions in the trial, along with hypogammaglobulinemia, infections-pathogen unspecified, pyrexia, decreased appetite, headache, encephalopathy, hypotension, bleeding episodes, tachycardia, nausea, diarrhea, vomiting, viral infectious disorders, hypoxia, fatigue, acute kidney injury and delirium. The FDA has approved a Risk Evaluation and Mitigation Strategy (REMS) for Kymriah designed to educate healthcare professionals about risks that may be associated with the treatment. Novartis said it will establishing a network of certified treatment centers throughout the country which will be fully trained on the use of Kymriah and appropriate patient care, in order to ensure safe patient access. Novartis plans additional filings for Kymriah in the U.S. and E.U. later this year, including applications with the FDA and European Medicines Agency (EMA), seeking approval for the additional indication of adult patients with r/r diffuse large B-cell lymphoma (DLBCL). Filings beyond the US and EU are anticipated in 2018, Novartis added. Novartis has set a $475,000 price for Kymriah—but added it has developed programs to support safe and timely access to the treatment, including support for patients pursuing insurance coverage and financial assistance for uninsured or underinsured patients. To that end, Novartis also announced a new collaboration with the U.S. Centers for Medicare and Medicaid Services (CMS) aimed at ensuring access for Kymriah’s patient population by basing pricing on clinical outcomes—a basis Novartis said would result in “value-based” care through the elimination of inefficiencies. Other value-based approaches related to future indications for Kymriah and CAR-T cell therapies are under discussion, Novartis said. The company added that it is working with CMS and private payers to be paid when pediatric and young adult ALL patients respond to Kymriah by the end of the first month, with future potential indications to be reviewed for the “most relevant” outcomes-based approach. Cost and reimbursement are among key challenges to the development of cell-based therapies, as are commercialization, market access, patient and physician adoption, and manufacturing scale-up, the International Society for Cellular Therapy (ISCT) said in a statement on Kymriah’s approval. According to the Society, more than 40 companies are developing redirected T cells or NK cells for therapeutic use, with more than 800 cell therapy clinical trials underway worldwide. “We are so proud to be part of this historic moment in cancer treatment and are deeply grateful to our researchers, collaborators, and the patients and families who participated in the Kymriah clinical program,” added Bruno Strigini, CEO of Novartis Oncology.